There was a wonderful little moment at my screening of Kubo and the Two Strings, the latest stop-motion wonder from Laika, the animation studio previously behind Coraline, ParaNorman, and The Boxtrolls. I’d like to share it with you, because there’s a point I want to make with it, and also it’s a pretty funny moment. To set the scene, the auditorium is half filled with young children, who by this point are fully engrossed in the film. They were laughing at the right moments, being awed at some of the highly inventive imagery, and clearly having a blast. But then, around the second-to-third act break, a very intense and even upsetting scene occurs. It’s a deathly serious moment, one that impacts the plot in many ways we won’t dare ruin for you here. And just as the screen turns white, and fades back into the scene as the characters are reacting to the on-screen incident, a lone young voice in the silent crowd candidly says, “I don’t like this.” It got everyone else in the audience, including myself, laughing quite a lot, despite what was being shown on screen being anything but laughable. It was a moment that brought everyone in that auditorium back to reality with a thud, having up to that point been on the edge of their seats, engrossed by the power of this film’s storytelling. For me, that’s the sign of a truly captivating film, when a story and its characters are so strong that all it takes is a child’s innocent declaration to remind us all that we are in fact sitting down and watching a screen. Otherwise, we would have all been convinced that these stop-motion puppets and the magical world which they inhabit were as real as the device you’re reading this on, and by goodness I wish that it truly was. A stunningly beautiful film from start to finish, both in its visuals and its heart-breaking narrative, it follows a one-eyed young boy named Kubo (Art Parkinson), who lives in a cave with his ailing mother in Ancient Japan. He possesses magical abilities that allow him to create living origami models of anything from small samurais to birds, all with a few plucks of his shamisen. One night, he disobeys his mother’s warning to not stay out after dark, and is suddenly targeted by the evil Moon King (Ralph Fiennes), Kubo’s grandfather, and a pair of creepy twin sisters (both Rooney Mara) that are also his aunts. 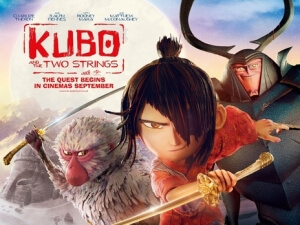 Before he knows it, young Kubo is sent on a quest to reclaim his late father’s mystical armour in order to defeat the Moon King, accompanied by a stern and no-nonsense Monkey (Charlize Theron) and later a man-sized Beetle (Matthew McConaughey). As it was with ParaNorman (as both Coraline and The Boxtrolls were based on books), it’s so refreshing to see a studio like Laika try and bring some originality back to modern kids’ films, and do it in such a way that’s both creative and mesmerising to look at. This film is oozing with originality, and it takes every single advantage of the fact that it’s animated and that the only limitations in place are in the imaginations of its writers and directors. Incidentally, this is the first Laika film directed by its president and CEO Travis Knight, and you can tell that he absolutely adores the very line of work he has been placed in charge of. He lets every single frame and shot show the emotion of its characters, as well as the beautiful simplicity of just the tiniest things like the hair on Kubo’s head or a stunning dialogue-free opening scene that handles parental depression more maturely than some other films meant more for adults. Best of all, he allows you to become fully engrossed in the characters, making each one of them unique and lovable enough for you to really want them to make it out of harm’s way. When something scary happens, you’re scared for little Kubo or his new friends, and that’s because the writing is so strong and the direction so poignant that you actually care for what are in reality just a bunch of puppets manipulated by thousands of animators’ fingers. Speaking of which, it should come as no surprise to you that this film is a fantastically-animated slice of stop-motion goodness, but what you may actually be shocked to hear is how, with this film, Laika has reached a point where the stop-motion has become so smoothly executed that you’d swear that this was actually a computer-generated movie. Of course, it isn’t – at least, I think it isn’t, I honestly can’t tell – but there are scenes where even I doubt that something this seamless was created by human hands, without the aid of a computer. The animation in this movie is already fantastic, some of the studio’s best and most beautiful to date, but for it to get to a point where it’s hard to tell whether it’s practically there or not is honestly an incredible accomplishment; it might honestly be some of the best stop-motion animation I have ever seen, and given the high amount of quality that this studio has produced thus far – even its weakest film, arguably The Boxtrolls, is still beautifully crafted – that’s saying a lot. There is so much to adore about this film, from its consistent originality, to its compelling and lovable characters, to some absolutely beautiful animation, that it’s hard to know what else I can say about it without giving away much else. All I will say is that, unlike that kid, you will definitely like it. Kubo and the Two Strings is a gorgeous slice of stop-motion animation that thrives in its originality, a compelling and heart-breaking story, instantly lovable characters, and some of the most beautiful and most seamless animation of its kind.